I first got hooked on this film about five years ago when I saw it on the recommendation of a friend. I saw Firefly pretty soon afterward and I’ve watched both several times since then. 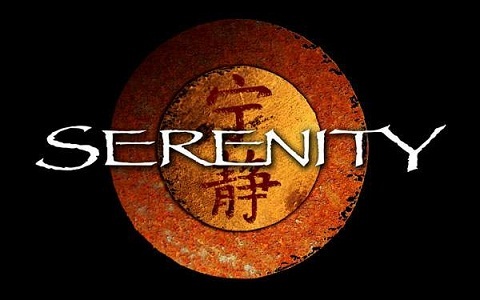 Of course, seeing Firefly then Serenity would be more chronologically correct, and according to some purists I’ve met, seeing them the other way is just plain wrong, but I think one of the successes of the film is that you can see it as a standalone story and not feel you’ve missed anything. To then see the stories and events that led up to it just adds to the experience rather than filling in the gaps. And once you’ve seen the whole lot five times over, well who cares which you saw first? So on to the film itself. The opening sequences are pretty cool, a kind of rolling pull-back from one setting to the next starting with the exodus from Earth, which then turns out to be a teaching display in River Tam’s old school (where we see her arguing the rights and wrongs of the Alliance’s subjugation of the breakaway colonies — “We’re not telling them what to think, we’re just trying to show them how”), which then turns out to be a memory forced back to the surface during her brainwashing by that same Alliance, which then turns out to be an archived playback of the day she was rescued by her brother. There’s a lot of information in those first few sequences, and it’s a great credit to the film that all this exposition comes across in a pretty complex series of scenes without once breaking the flow or appearing clunky. And when it finally takes us to the records-room holo-display — well, that’s where things start to get really good, because the guy who we see playing the whole thing back, at the start of his mission to recapture River Tam, has to be one of my favourite screen villains of all time. By the time the Alliance Operative (played brilliantly by Chiwetel Ejiofor) utters these chilling words, he has killed three people already (arguably on the same side as him) and displayed in brilliant style just how ruthless, refined, articulate and intelligent he is, entirely committed to the cause he serves and willing to do anything in his focused, almost sociopathic zeal. The chief scientist himself is dispatched in particularly gruesome style, given a karate-style spear-hand strike to the side, paralyzing his entire body so that he falls onto the Operative’s sword, which even then is not a particularly quick way to go. There’s a ritualistic side to the Operative too, the way he uses the same words before every kill (“Do you know what your sin is…?”), and it’s easy to believe that he’s been killing people with those same lines (and that same sword) for years. Then follow the opening titles, starting with the “Serenity” insignia on the side of the ship itself (of course we know exactly where River is hiding), and our first introduction to Mal, Zoe, Wash, Jayne, Kaylee, Simon and River herself. And I have to say it really is the characters who make the whole Firefly/Serenity thing so good. I remember a TV reviewer at the time saying that if the Star Wars prequels had even half the characterization and depth of personality as this film, maybe they wouldn’t have been panned so severely. Our introduction to these characters lasts for 14 minutes in all, filmed as one uninterrupted sequence running through the interior of pretty much the entire ship (they must have built the set to match the true interior layout of the whole vessel), as we see the crew preparing — and arguing — in advance of the job they’re about to pull. The bank job itself is refereshingly brutal, by which I mean there are plenty of films which have criminals as their heroes, but usually in an Ocean’s Eleven style, with sophisticated heists pulled off through a combination of high tech and clever planning. Mal and his crew are more toward the brute-force end of the criminal spectrum — armed robbery, hostages with guns to their heads, destruction in their wake. But considering they’ve been pretty much forced into this way of life by being on the losing side against the Alliance, it begins to make sense that people who are fundamentally good can find themselves having to make a living in this way. The job itself is to take the payroll of one of the outer settlement’s security firms (another nice touch, the fact that a security firm would never report the theft of their own payroll in case they appear weak), but what doesn’t make sense is why River has to come along on this particular job. Sure, it makes for some good arguments between Mal and her brother early on (“I hear the words ‘that’s final’ come out of your mouth ever again, they truly will be”), and sure, she does contribute by spotting the guy among the hostages who’s about to play hero, but that kind of thing could apply to any job they do. Making such a big issue out of having her on this job needs something specific, like maybe she has to spot the guy who has the safe codes in his head, or can figure out a lock where threats, guns and explosives won’t work. But it’s then, midway through the job, that the Reavers appear. I’m going to be honest here — I’ve always had my doubts about the Reavers. It’s the idea that these savage creatures, like a race of cannibal psychos fuelled by nothing but rage and hate, can somehow pilot spacecraft around interplanetary space and organize themselves into raiding parties — there’s a big plausibility hole there even given the crew’s initial ideas for where they came from (“They just saw the edge of space, saw a whole vast nothingness and went crazy…”). However when Mal hears of the attack and locks the same people he’s just been robbing into their own vault to keep them safe, and then shoots the guy who’s just been caught by the Reavers in order to save him from what they’d do to him — that and the conversation he and Zoe have later (“In the time of war, we would never have left a man behind” / “Maybe that’s why we lost”) add a lot to the characterization of these already very engaging people. Particularly effective is the ongoing enigma of Mal’s motivations — he acts like Simon and River are a burden he can only just tolerate, he says the war is over and he has no interest in picking fights any more, but deep down there are signs of the old idealist in him, that abandoning Simon and River to their fate is something he can’t bring himself to do no matter how much danger he puts himself in by sheltering them. The next place they go, the (town? planet?) of Beaumont where they meet the guys who put them up to the job (Fanti and Mingo, pretty interesting characters themselves) has more than a touch of Bladerunner to it, and it’s here that Mal’s crew and the Operative are first set on a collision course. I really like the kind of devious tactics he uses against them, and this is no exception — flooding the system-wide TV broadcasts with the subliminal signals that River has been programmed to respond to, knowing that the resulting fracas will show up her location in no time. And when River does go into combat mode, triggered by the brilliantly bizarre “Fruity Oaty Bar” commercial, she fights like she’s been taking on men twice her size all her life. Though it does seem very convenient that in that crowded bar, the security camera and audio recorders just happen to pick up that one crucial word “Miranda” that Mal and co subsequently hear on the playback. The way Simon ends the fight is pretty cool though, via the safe word that he’s kept to himself all this time (“Eto kuram na smech” — or “That’s for chickens to laugh at,” a phrase in Russian meaning “That’s ridiculous”; the DVD subtitles just say, wrongly, “Speaks Chinese” at this point.) And it’s when the Operative sees that same recording from the bar and identifies Mal as a veteran of the uprising (with a commendation from “The Battle of Serenity Valley”) that he finally realizes who he’s dealing with. Shepherd Book is the next of the old characters we see, now living among a small settler community on one of the outer worlds, Haven. He doesn’t play a huge role in this film, more of an advisor to Mal, but he’s one of Mal’s crew in Firefly and there are intriguing hints of what he used to do before he took up preaching, not least in how he knows so much about Alliance Operatives and how they might move against Mal. (“It’s of interest to me how much you seem to know about that world” / “I wasn’t born a shepherd, Mal” / “You have to tell me about that sometime” / “No, I don’t”) In fact I’ve even heard a rumour that Book used to be an Operative himself — not sure if that fits his character, but in one of the Firefly episodes where he’s severely injured, the ID card that gets him government-grade treatment on one of the inner worlds had to come from somewhere. I think if Firefly had been allowed to continue, one of the things would have learned is more about Book’s past. It’s not long after this that Mal and the Operative first meet face to face. There’s some great dialogue between them, once Mal has knowingly walked into the trap at Inara’s training house, and it’s great to watch the exchange between these two brilliant characters even before they start hurling punches (and stun grenades) at one another. “You can’t make me angry,” the Operative says to Mal. “Please, spend an hour with him,” Inara replies. And when the Operative shows just how well he knows his own nature and his place in the world (or the perfect world he’s striving to create) the fact he’s not as deluded as we might have thought just makes him that little bit scarier. They certainly put in some miles from this point on, running from the Alliance forces, moving from world to world. As a hard-SF writer myself, one thing I can’t help looking out for in films like this is the way that space travel and colonisation are handled. And I have to say I never really got a feel for the scale of space that’s being depicted here (both in the film and in Firefly). Are these worlds all going round the same star? (We see a solar-system-like map at one point, and there is talk of humanity having moved to a “new system”, but if that is the case then the outer planets will be pretty cold, not at all like the desert worlds we are shown.) Or are they separate systems, spread through one corner of the galaxy with ships moving around via some kind of warp drive? It seems to be the former that’s being depicted, but ideas such as Reaver space being a distinct location between two planets, with a conveniently placed “ion cloud” on the same bearing, don’t fit well with ideas of orbital mechanics (i.e. everything going round at different rates). Space seems to be depicted as a kind of ocean here, with planets like islands, keeping their relative positions throughout. But before the footage can be broadcast, there’s more fighting to be done, including the film’s big set-piece space battle between the Alliance forces and the Reaver ships. It’s pretty good as battles go, nice and punchy with plenty of hardware flying around, and I particularly liked the image, once Serenity was plummeting toward Mr. Universe’s homeworld, of those daylight meteors streaking through the upper atmosphere as the ships above were destroyed. In summary, I’d give this one 9 out of 10. It has lines I remember and quote all the time, the kind of dialogue and characterization I can only dream of creating for myself, and probably the most sinister yet infinitely watchable movie bad-guys I’ve ever seen. Definitely one to keep.